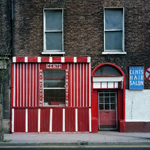 a long-term study of Dublin’s inner city in the 1980s and early 1990s. 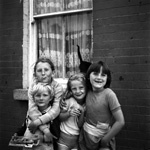 As David Jazay was acutely aware at the time, Dublin was changing fast, and most of the premises he set out to document were under immediate threat of demolition. 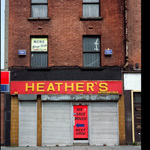 This poor but lively city, home to generations of Dubliners, and specific aspects of its local business culture would be irretrievably lost within a few years. When he set out on his photographic study of the inner city, he used fine-grained medium format film to capture as much detail as possible. It would take him ten years of annual visits, during which he managed to capture the changing cityscape. Double-click the above image to get an idea of its amazing resolution. In 2014, enabled by recent improvements in computer image processing technology, he could finally set about fully realising this project. Elaborate, multiple vanishing point panoramas, showing the Liffey Quays before re-development, in their entire length, are conceived as very large prints, allowing new generations to experience the Dublin of that pivotal era, now largely lost to visual memory. Never before has a city’s everyday heritage been photographed with such scope, dedication and attention to detail. Jazay’s high-resolution photographs hark back to the vedutas of the Georgian age, and have been praised as an “amazingly beautiful, incredibly detailed”, “reconstruction of Dublin’s inner city”. Much like in that famous quote attributed to Joyce “… if the city one day suddenly disappeared from the earth it could be reconstructed …(from his “Ulysses”)”, I too had the madness and the ambition to photograph every building under threat of demolition, document what I could of the last cornershops, antique furniture businesses and auction houses along the Liffey. I concentrated on Georgian architectural ensembles (still posessing grandeur in dilapidation) and the poor but lively Inner City neighbourhoods: shopkeepers, marketers, children playing in the streets, local characters. This whole microcosm would irrevocably change a few years later, in the boom years of the Celtic Tiger.